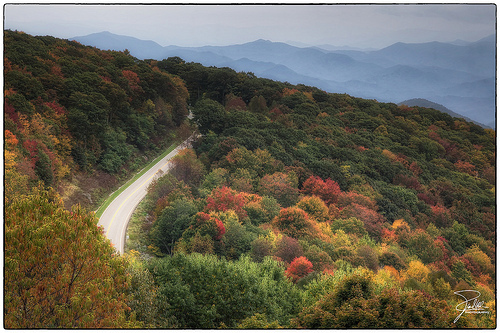 From the coast to the mountains, North Carolina highways include a number of scenic byways. Running from the Great Smoky Mountains National Park to Virginia's Shenandoah National Park, the Blue Ridge Parkway forms a narrow, linear preserve for automobile touring along the crest of the Blue Ridge range. With an average elevation of 3,000 feet, the parkway runs 469 miles, offering panoramic views of coves, valleys, and distant ridges. Begun in 1935, the roadway was completed near Grandfather Mountain with the construction of the Linn Cove Viaduct, itself a marvel of modern engineering. The Cherohala Skyway passes through the Cherokee and Nantahala National Forests (for which it is named), extending 36 miles between the mountains of North Carolina and Tennessee. The dream of what would become North Carolina's most expensive highway at $100 million began in 1958, when hundreds of horseback riders and dozens of covered wagons traveled from Tennessee to Murphy, N.C., in an organized wagon train event that thereafter was celebrated annually. After several setbacks, the highway officially opened in 1996, connecting Tellico Plains, Tenn., and Robbinsville, N.C. The Cherohala Skyway is popular among motorcyclists, car enthusiasts, and tourists in search of breathtaking natural scenery. North Carolina's more than 40 other scenic routes include the Alligator River Route, running through the swamps and wetlands just inland from the Atlantic Coast (Dare and Tyrrell Counties); the Blue-Gray Scenic Byway, a history-rich tour of Civil War sites and landscapes (Johnston, Wayne, Lenoir, and Jones Counties); the Outer Banks Scenic Byway, running down the state's barrier islands from Whalebone to Beaufort (Dare, Hyde, and Carteret Counties); and the Millbridge Scenic Byway, offering drivers a memorable trip through the rural, small-town North Carolina countryside (Rowan County). Kehren, Frank. "Cherohala Skyway." Mcguires, North Carolina, US, September 30, 2012. Available from: Flickr Commons, http://www.flickr.com/photos/fkehren/8049407379/ (accessed December 6, 2012).